President Obama gave a speech Wednesday in Galesburg, Illinois to kick off his campaign-style tour of the Midwest that unveils his agenda for reinvigorating the economy. Many elements of the plan Obama unveiled are revived components of his largely stalled economic program. He outlined five cornerstones of the strong and growing middle class he wants to create: Job creation (especially in the energy and manufacturing industries), affordable quality education, home ownership, secure retirement, and healthcare. Here are the quotes from the speech you will want to know about. Obama denounced inequality, offering a startling statistic. "The average CEO has gotten a raise of nearly 40 percent since 2009, but the average American earns less than he or she did in 1999," he said. "...This growing inequality isn’t just morally wrong; it’s bad economics." He made an argument for the importance of education in fewer than 20 words. In my favorite quote from the entire speech, Obama said, "If you think education is expensive, wait until you see how much ignorance costs in the 21st century." 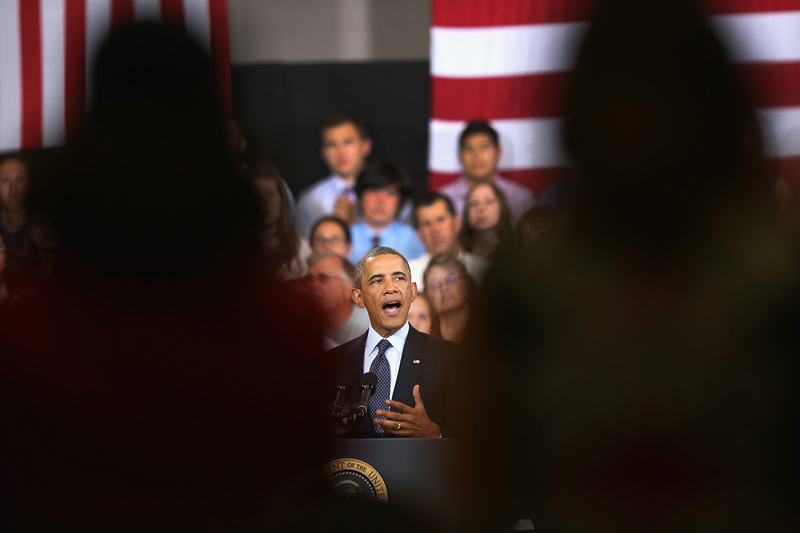 The president championed an increase in minimum wage. "And because no one who works full-time in America should have to live in poverty, I will keep making the case that we need to raise a minimum wage that in real terms is lower than it was when Ronald Reagan took office," he said. He said Democrats need to be open to changing their ideas. "We’ll need Democrats to question old assumptions, be willing to redesign or get rid of programs that no longer work, and embrace changes to cherished priorities so that they work better in this new age," he explained. "For if we believe that government can give the middle class a fair shot in this new century, we have an obligation to prove it." Obama also said there are Republicans in Congress who do agree with him. "The fact is, there are Republicans in Congress right now who privately agree with me on many of the ideas I’ll be proposing, but worry they’ll face swift political retaliation for saying so," he said. "Others will dismiss every idea I put forward either because they’re playing to their most strident supporters, or because they have a fundamentally different vision for America — one that says inequality is both inevitable and just; one that says an unfettered free market without any restraints inevitably produces the best outcomes, regardless of the pain and uncertainty imposed on ordinary families." Those weren't the only fighting words he had for Congress. "If you think you have a better plan for making sure every American has the security of quality, affordable health care, stop taking meaningless repeal votes and share your concrete ideas with the country," he said. Improving America is the president's number one priority. "I have now run my last campaign," he said. "I do not intend to wait until the next one before tackling the issues that matter. I care about one thing and one thing only, and that’s how to use every minute of the 1,276 days remaining in my term to make this country work for working Americans again. Because I believe this is where America needs to go. I believe this is where the American people want to go."